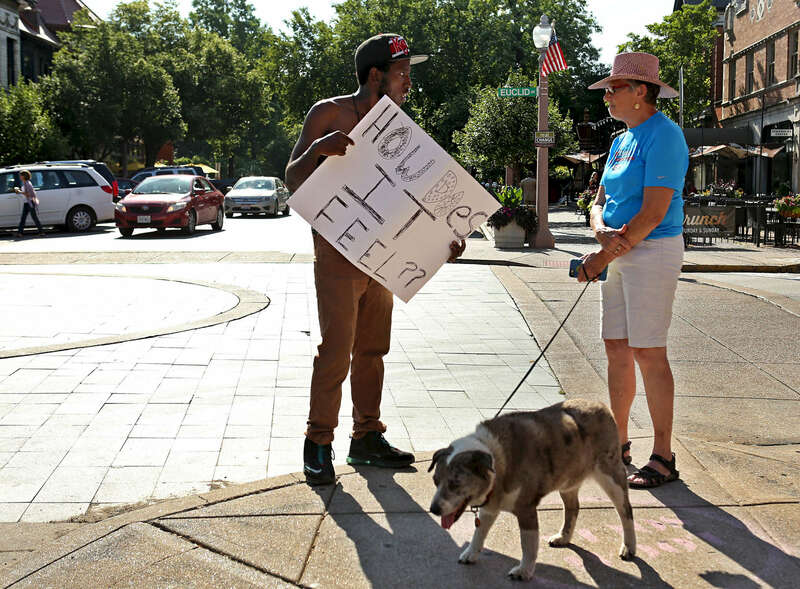 Dhoruba Shakur (left), and Anna Forder have a discussion at the intersection of Euclid Avenue and Maryland Avenue close to where a St. Louis police sergeant was shot on Tuesday, July 14, 2015. Shakur, a community activists and regular protester, was standing at the intersection with a sign that read "How does it feel??" when Forder approached him and the pair began talking. Forder, a retired St. Louis judge, told Shakur she felt the sign was "taunting". Shakir said he was holding the sign "So people feel disrespected the way I feel disrespected every day". Shakur feels that the United States was founded on white supremacy and that it still impacts his life. The pair talked calmly for more than 5 minutes debating issues of race and violence. The conversation ended politely and they parted with an exchange of smiles. "He's a smart young man. He's educated. But I'm very upset about the shooting of the police officer" said Forder who felt the conversation had been positive. Shakur felt differently about the conversation "She was being condescending".